The access methods permit a user to access the mailbox in a variety of different ways. Prior to actually using them they need to be authorised in the Cobweb Control Panel. Log into the Cobweb Control Panel and click Exchange. Select the user you want to change the access methods for. Scroll down and click Edit. Scroll down, under the Mailbox Access click the check boxes which you want the user to have access to their mailbox. Please note not all mailboxes will have access to all the different access methods. 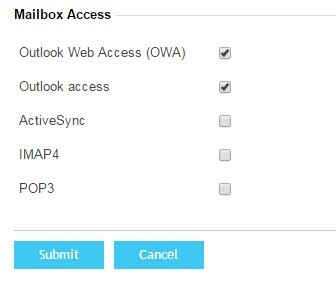 Outlook access: This will allow the user to access their mailbox via Outlook on the PC or MAC as an Exchange account. IMAP4: This will allow a user to set up their mailbox as IMAP4. All emails are kept on the server. 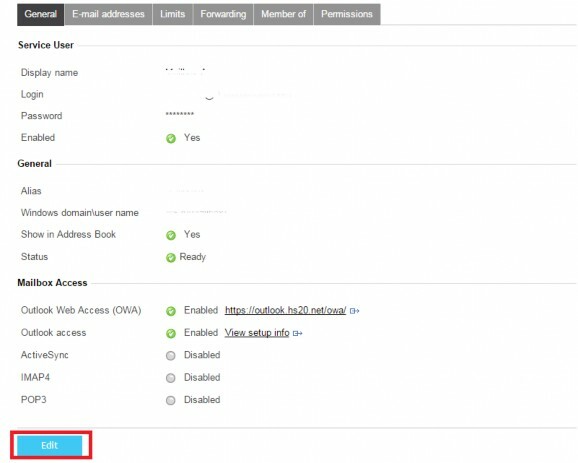 POP3: This will allow a user to set up their mailbox as POP3. By default this will download all the emails onto the local machine.